Sited on a promontory in the Hollywood Hills, this house for a couple was formed by the competing desire for spaces that were both inwardly focused and capitalized on canonical views of Los Angeles’s geography. The sequence of movement through the 3,000 s.f residence is designed so one is always looking through a space that is inside and outside simultaneously – an interior outdoor room and outdoor interior room – with strategic locations of glass and balconies for focused views. 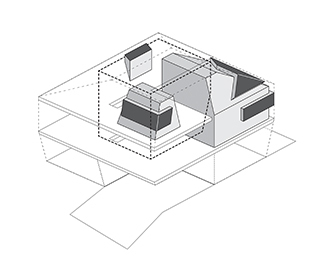 With the habitable areas of the house distributed within the buildable volume according to elevation and proximity to sight lines, the geometry of the enclosure is then inflected from contextual pressures. Inputs from zoning, contour lines, and local site connections create a faceted figure that is shaped by its surroundings while producing a novel experience of interiority. The three story residence is organized around two double height spaces – one interior on the northeast corner, and one exterior on the southeast. 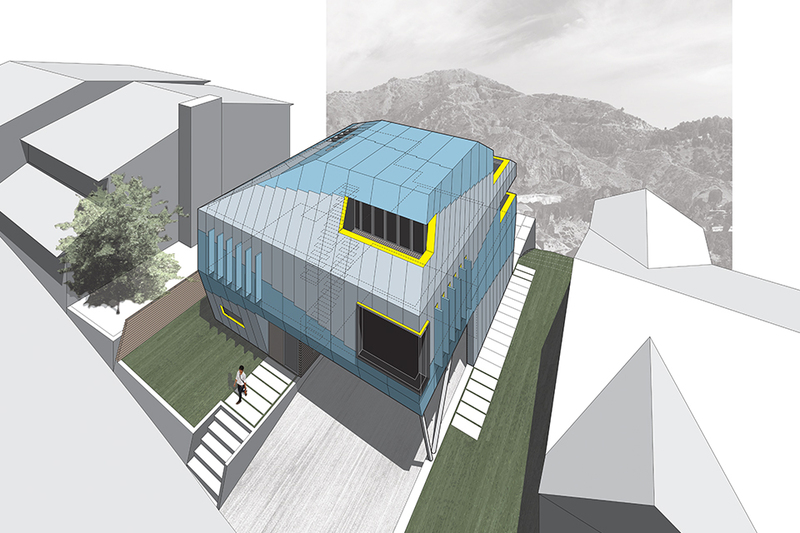 Both face the rear of the property opening onto a patio hovering above the surrounding hills and Griffith Park. The living and dining room on the first floor lock around a two story interior volume with a second floor office overlooking the space below. A skylight captures glimpses of the Hollywood sign to the north and washes the space with indirect light. Two bedrooms are stacked one above the other on the southwest corner of the house. A double height elevated outdoor room links the two sleeping spaces with corner views of Downtown LA. Both bedrooms also face the front of the property with diagonal views towards Santa Monica Beach and the setting sun to the west.